Independence Day, commonly known as the Fourth of July or July Fourth, is a federal holiday in the United Statescommemorating the adoption of the Declaration of Independence on July 4, 1776, declaring independence from Great Britain. 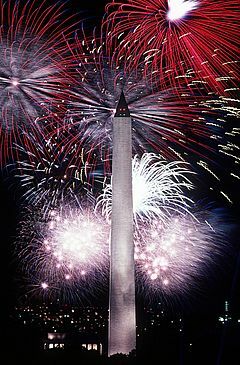 Independence Day is commonly associated with fireworks, parades, barbecues, carnivals, fairs, picnics, concerts, baseball games,family reunions, and political speeches and ceremonies, in addition to various other public and private events celebrating the history, government, and traditions of the United States. Independence Day is the National Day of the United States.